In the 1960s the US Navy developed three undersea habitats, in order to experiment with saturation diving and to explore the possibility of humans living on the ocean floor. Of necessity, any group of people engaged in this pursuit would be separated from life on the surface, in some cases by days or weeks of decompression obligations. SEALAB I, II and II were progressively deeper and more complex habitats. Developing them was a technical challenge that led to many advances that we benefit from today. The experiments also provided an opportunity to study the psychological and physiological effects of isolation, and of long periods of breathing mixed gases under pressure. The SEALAB experiments took place during the same era as the efforts by NASA to put a person on the moon, and received far less attention. Jacques Cousteau was interested in the project, and himself experimented with underwater habitats called ConShelf I, II and II. These habitats were far better publicised than the US Navy’s efforts, even though their aims were more modest. 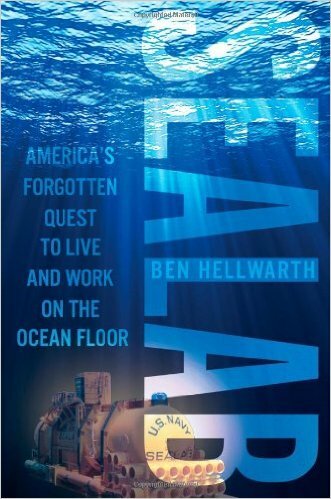 Author Ben Hellwarth does not confine his attention to the habitats, but also provides a fairly detailed history of decompression theory and diving history. 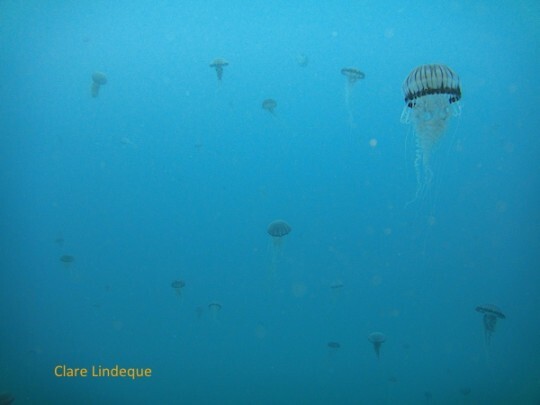 Like Neutral Buoyancy, SEALAB might provide a relatively painless introduction to dive theory for Divemaster candidates. In fact, this book reads like a thriller at times! Some photographs from the SEALAB projects are available on the US Navy website, and in this slideshow. To our modern eyes, the clunky and primitive appearance of some of the gear is a reminder of how pioneering the now 60 year old work to allow humans to live and work in the sea was. If you’re interested in the history of saturation diving, I recommend this article, which covers some of the ground that Hellwarth does in SEALAB. If you want to see it in action, check out Pioneer (fictional movie based on actual events) or the series Deep Sea Salvage. You should also check out this article by Hellwarth, entitled The Other Final Frontier, and this podcast/radio show. If you are EXTREMELY interested in this subject but don’t want to read a book, try out this hour-long lecture video by Ben Hellwarth. Experiments with underwater habitats are ongoing. Get a copy of SEALAB here (South Africa) otherwise here or here. The Fermi Paradox is the seeming contradiction between the high estimated probability that extraterrestrial life exists, and the lack of evidence for any such life so far. If you can’t see fish (analogous to the aliens), they’re probably camouflaged. Why would that be necessary? Perhaps a predator is doing the rounds? The most likely threat to civilisation on earth, apart from our good selves, would be another civilisation. This is actually quite a terrifying comic. See the original on the xkcd website. Want more explanation? Try here. 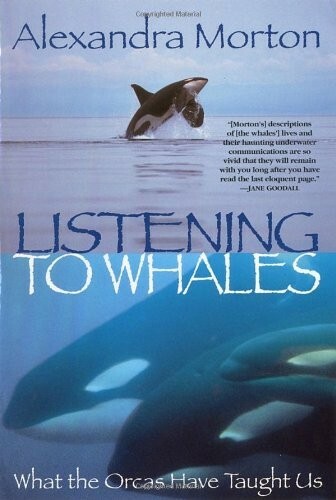 Listening to Whales is marine biologist Alexandra Hubbard’s memoir of the thirty-odd years she spent studying wild killer whales, as well as other cetacean species. Morton was born in the United States, the daughter of a famous artist, but discovered her passion for cetaceans while working for eccentric dolphin researcher John C. Lilly. Her orca research took her into Canada’s remote Broughton Archipelago, where she and her husband (who passed away during the research in a solo rebreather diving accident) lived a romantic, itinerant, lonely, and very challenging life following pods of wild orca around and studying their communication. Morton also spent time in oceanariums and theme parks, observing and working with captive orcas and dolphins. Her insights into the trauma that these unnatural environments inflict on the animals held there are illuminating, and dovetail with the observations made in articles such as The Killer in the Pool and Blood in the Water, and Death at Seaworld. When the orcas disappeared from British Colombia’s remote waters, Morton wanted to find out why. She soon discovered the reason for their absence: there was a growing number of salmon farms, which started proliferating in earnest in the late 1980s, in the archipelago. The salmon farms used Acoustic Harassment Devices (AHDs) to chase away seals that preyed on the captive salmon. Since sound is of vital importance to orcas for hunting, echo location, and communication, the whales found the noisy environment unliveable and intolerable, and left the area. Morton’s persistence (she wrote over 10,000 letters) led to the withdrawal of the AHDs starting in the early 2000s. The salmon farms have affected the area in ways other than noise pollution. They generate massive amounts of physical pollutants (from excess food pellets, waste products, and antibiotics used to treat the farmed fish), reducing the water quality. The salmon are also prone to infestation by parasites. Because the farmed fish are kept in such close quarters, there is unchecked spread of diseases and this can spill over to wild populations. There are also potentially serious consequences if farmed salmon escape and breed with wild salmon populations. The fish farming industry is growing rapidly in both size and vogue, and there is massive financial incentive for companies (and government bodies) to cover up the shortcomings and failures of mariculture. Morton’s work uncovering the abuses occurring in Canadian (and other) salmon farming continues to this day. She is a hero. I think that if I’d had more access to women who were working as scientists when I was a child, my career might have panned out a little differently from the way it has. This is why I am very enthusiastic to discover memoirs by women who are respected in their chosen field, particularly when pursuing that particular field of study would seem to preclude some of the things that some people want, such as a stable family life. Whale scientist Elin Kelsey’s book Watching Giants also falls into this category. Morton’s life story is one of a wandering, resourceful, curious person who has managed to combine significant scientific output with a fulfilling life that has included raising two children, one of whom now works at NASA. Part of her son’s childhood was spent curled up in the bow of the Zodiac his parents were using to track pods of orca! I’d strongly recommend this book to girls considering a career in the natural sciences, and to anyone else who is interested in the ocean, killer whales, fish farming, or just in interesting lives well lived. You can get a copy here or here. 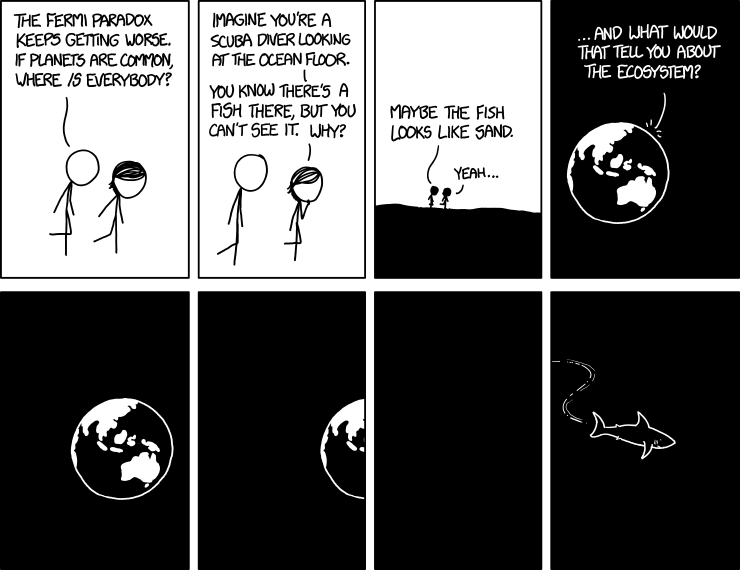 Randall Munroe of xkcd (all hail!) tackles another hypothetical question, and applies SCIENCE and some thought experiments to come up with an answer. Last time he discussed draining the oceans, a plug was pulled at the bottom of the Mariana Trench. tl;dr the Netherlands took over the world. This time the water will be transported to Mars and poured into the Gale Crater. What will that do to the Martian landscape? Phil Plait, the Bad Astronomer, writes briefly about images released in June 2011, taken by the earth-observing satellite Aquarius. Observations like this are crucial for us to understand just how our fiendishly complex planet works. Especially now, when our climate is changing, and those changes are evident even year by year. Here’s another image of my favourite city, taken by Canadian astronaut and all round amazing chap, Colonel Chris Hadfield, while he was on the International Space Station. I had to look at it for a while before I could figure out what part of the city I was looking at. On the left of the image is False Bay, and at the top left of the image you can just see the Strandfontein sewerage ponds that you pass when driving along Baden Powell drive, looking like shiny patches of mercury just inland from the beach. This is a popular bird watching location. 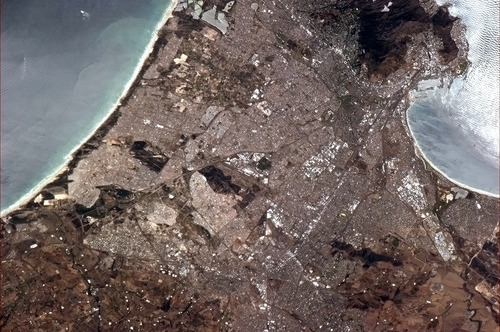 On the right is Table Bay, with the harbour visible at the top right of the image. It’s hard to be dogmatic about it, but from the wind pattern on Table Bay it seems the south easter was blowing when this picture was taken. The mountain protects the inshore sites on the Atlantic seaboard from the wind. If you draw a line across the top of the image from the harbour to the sewerage ponds, you’re cutting right through the southern suburbs – basically the area between the M3 and M5. The bulk of the bottom of the image is the Cape flats. If you rotate this map clockwise by 90 degrees, you’ll have a pretty good idea of the orientation of this picture. We’re more familiar with False Bay and Cape Town looking like this or like this! 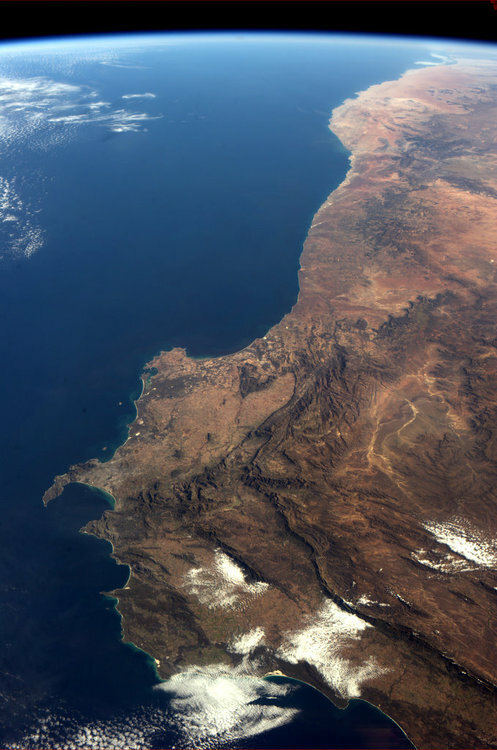 Chris Hadfield, who commanded the International Space Station for a couple of months before returning to earth mid-May, took this wonderful photograph of the Western Cape while he was orbiting the earth. You can see what a special bay False Bay is, and how sheltered its interior is compared to other, more open bays around the coast. Love your work, Commander Hadfield! Here’s another incredible picture taken by Commander Chris Hadfield on the International Space Station. When I wrote about two articles on the effects of trawling I looked for a picture that showed exactly what a bottom trawling fishing vessel (such as a shrimp boat) does to the sea floor, and how visible the effects are from space or satellite altitude. This photo hadn’t been taken yet! 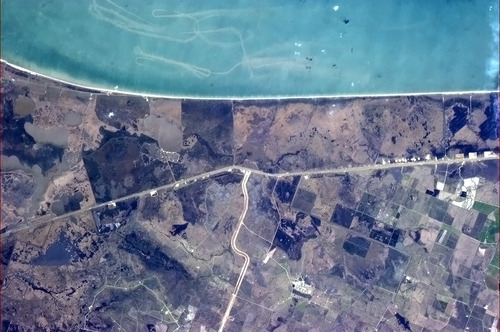 The image shows a piece of the coastline of Texas in the United States. In the sea you can see the tracks of a shrimp boat, which has stirred up the bottom of the ocean so much that it’s visible from a great height. As you can imagine, this is an extremely destructive fishing technique. You can google it if you want more information on bottom trawling fishing techniques, but here’s a diagram of how it works in general.